We’ve spent the last two lessons (lesson 24 and lesson 25) talking about the extremely important permutation groups, and in this lesson we’re going to take a look at another important class of groups: the dihedral groups. Recall that permutation groups were groups of actions on a particular set. Namely, we had some “dummy set” with a finite number of elements, and then we defined our group elements to be the set of permutations of this set. Thus, the set was sort of “in the background”, and all the meat of the group was in the actions that we performed on the set. In a completely analogous way, dihedral groups are groups of actions of regular polygons. Let’s take a look at these cool groups. First, we need to recall what a regular polygon is, and to do that we need to recall what a polygon is in the first place. By “polygon”, I just mean some two dimensional figure composed of a finite number of straight lines, like that shown in figure 1. That seems simple enough. figure 1: A polygon (irregular). Now, a regular polygon is one that is somehow “maximally symmetric”, which in this case means that all of the edges are of the same size, and all of the angles between the edges are the same as well. Figure 2 shows the three to ten-sided regular polygons (for example, a stop sign is nothing but an 8-sided regular polygon, or an octagon). 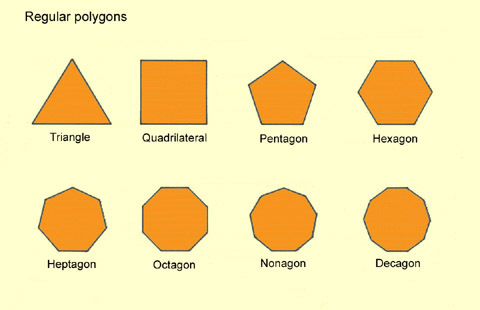 As a side note, it might be clear from figure 2 that there are infinitely many distinct regular polygons, simply because we can keep adding sides to them. And as should be clear, the more sides we add the more these polygons resemble a circle, and indeed a circle can be viewed in some way as a “limit” of this infinite family of regular polygons. But that’ll be a discussion we won’t get to for quite some time. Now what do regular polygons have to do with group theory? As I briefly mentioned in the solution to the exercise in lesson 22, we can form a group out of some of the various ways to transform a regular polygon while keeping it so that the transformed polygon still “looks the same” as the original one did. I’ll try to be a bit more precise in a bit. 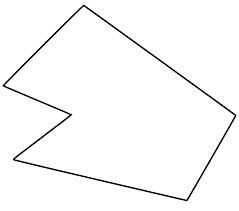 For now, imagine laying a square napkin (a 4-sided regular polygon) on a coffee table. Now, there are various things I can do to that napkin. I can rotate it by 45 degrees in some direction, or I can rotate it by 90 degrees in some direction. However, these two rotations are very different, in the following way. Imagine you and some friends are sitting around watching the Lakers slaughter the Celtics in game 7 of the 2010 NBA finals, and you’ve picked up your beverage of choice from your square napkin on the table and taken it with you into the kitchen to get some wings. As you’re gone, a friend of yours thinks he is sly by rotating your napkin by 45 degrees. When you come back into the room—drink in hand, and buffalo sauce on your fingers—you’ll be able to notice that the napkin has been moved, because now it looks like a diamond. However, if your friend were smarter and rotated it by 90 degrees, or 180 degrees, or 270 degrees, or flipped it over along an axis of symmetry (which I’ll describe shortly), then you wouldn’t be able to know that it was changed at all (assuming the napkin is sufficiently uniform in appearance). Your friend will then be able to get away with, or at least plausibly deny, any such deviant yet completely useless behavior. That, right there, is what the dihedral group is all about. Let’s start to make this a bit more mathematical. Consider a square, and all of the various ways that we can rotate and reflect it so that it remains looking like a square (I’ll provide visuals below). We have rotations (say, counterclockwise) by 90 degrees, by 180 degrees, and by 270 degrees. We can, obviously, also just leave the square alone, and not move it at all. These are thus four actions (including the action of “not doing anything”) that we can apply to the square, such that it still looks like the same square that we started with: “do nothing”, “rotate by 90 degrees”, “rotate by 180 degrees”, and “rotate by 270 degrees”. We note that “rotate by 360 degrees” is viewed as simply leaving the napkin alone, since the napkin returns to its exact original state. Similarly, a rotation by 450 degrees is the same as a rotation by 90 degrees, and so one. We therefore have only 4 such rotations. However, there are some more actions that we can perform on the napkin so that it will still look exactly the same as it did before the action. First, we need to suppose the napkin looks the same on both sides, so that the side “facing up” looks the same as the side “facing down”. Now suppose we draw a diagonal line through the square, connecting the top left corner to the bottom right corner, and rotate the square “around” or “through” that axis (i.e., pick up the napkin and flip it over so that the side facing up is now facing down, and perform this flip about the diagonal that we drew) so that the lower left corner and the upper right corner trade places, while the two corners with the diagonal line drawn through them remain in place (if you’re struggling to visualize this, don’t worry, I’ll provide visuals shortly). We can then do the same thing with the diagonal drawn between the other two corners (the upper left and lower right). We can also rotate the square around the axis that connects the midpoint of the top edge to the midpoint of the bottom edge, or around the axis that connects the midpoint of the left edge to the midpoint of the right edge. Let’s actually see what this all looks like. At the bottom of this lesson I’ve provided 8 images, numbered 1 through 8 (hence the distinction between “image” and “figure”, so that I can number these 1-8 as opposed to 3-10 when including the above figures). Each image contains a square that has four dots on it, each of a different color. We should think of the dots as being painted onto the square itself, and suppose the square is made of glass so that we can see the dots from both sides of the square (i.e., we can flip the square over and still see the dots). We should then think of the numbers 1, 2, 3, and 4 as being written on the coffee table (not the square), and therefore the numbers don’t move as we move the square around. The dots are just there to help us follow how the square moves, and the numbers are written on the table just so that we can specify how to move the square. In particular, a 90 degree counterclockwise rotation is one that moves the square in such a way that whatever corner is at corner 1 gets moved to corner 2, corner 2 goes to corner 3, corner 3 goes to corner 4, and corner 4 goes to corner 1. I’ll denote this by to specify how the corners move (relative to the corners that are drawn on the table). Let us denote this action by (“rho 1”). Similarly, a 180 degree counterclockwise rotation (all rotations will now be assumed counterclockwise, so I’ll stop explicitly writing it) will correspond to , and we’ll denote this action by . A 270 degree rotation is then , and is denoted by . Let’s also denote the action of “not doing anything”, i.e., , etc., by . So far we then have , and soon you’ll see why I’m using this suggestive notation (i.e., why I’m using set notation). There’s the so called “reflections”, which are those actions that we apply to the square that involve “picking it up and flipping it over”. The key thing to realize is that an action of this kind is completely characterized by the axis about which we rotate. Let me explain this. Consider picking a napkin up and simply flipping it over. There are several ways that we can do this while still maintaining its “squareness” (well, the napkin is always a square, assuming we don’t rip it, but what I mean is its original appearance on the table). Imagine drawing a line from corner 2 to corner 4 on the table, and then picking up the napkin and rotating it so that the corners at 2 and 4 don’t move. What we’re doing here is switching corners 1 and 3 while leaving corners 2 and 4 alone. This can be viewed as a reflection, in that we can think of the line that we drew on the table as a sort of “reflection line”. Everything on one side of the line goes to the corresponding point on the opposite side of the line. Thus, those points lying directly on the line remain fixed, and the other corners switch spots. I think it’s easier to view this as a rotation (of flip) through a higher dimension, where in this case the higher dimension is the “third dimension”, namely, the dimension that you picked the napkin up into. I.e., you couldn’t perform this action while keeping the napkin on the (two dimensional) table, you had to pick it up and flip it through a direction that we don’t have available to us while the napkin is stuck on the table. This transformation, which we denote by , is , with corners 2 and 4 staying fixed. We could also draw the other diagonal line, from 1 to 3, and get the transformation , which keeps 1 and 3 fixed. Denote this tranformation by (and don’t worry, visual examples coming soon!). Second to lastly, we can consider the point halfway between 1 and 2, and the point halfway between 3 and 4, and draw a line connecting them. We can then flip the napkin around that line (through the third dimension), giving . Denote this by . Lastly, consider the point halfway between 1 and 4, and the point halfway between 2 and 3, draw their connecting line, and flip the napkin around that line (again through the third dimension), giving the transformation and denote this by . Suppose our square starts off life in position 1 (I now refer to “positions” instead of “images”, so that the image below labeled as 1 is now “position 1”). Then keeps it there, takes it to 2 (position 2, not corner 2), takes it to 3, and takes it to 4. (which is the “flip” about the diagonal defined above, resulting in ) takes position 1 to position 5, (which is the “flip” about the other diagonal, taking ) takes position 1 to position 6, (which is a “flip” about the line drawn between the midpoint of 1 and 2, and the midpoint of 3 and 4, and gives ) takes position 1 to position 7, and (the “flip” about the line drawn between the other pair of midpoints, giving ) takes position 1 to position 8. Note that we can start at any of these 8 positions and get to any other position by applying (some combination of) these actions. 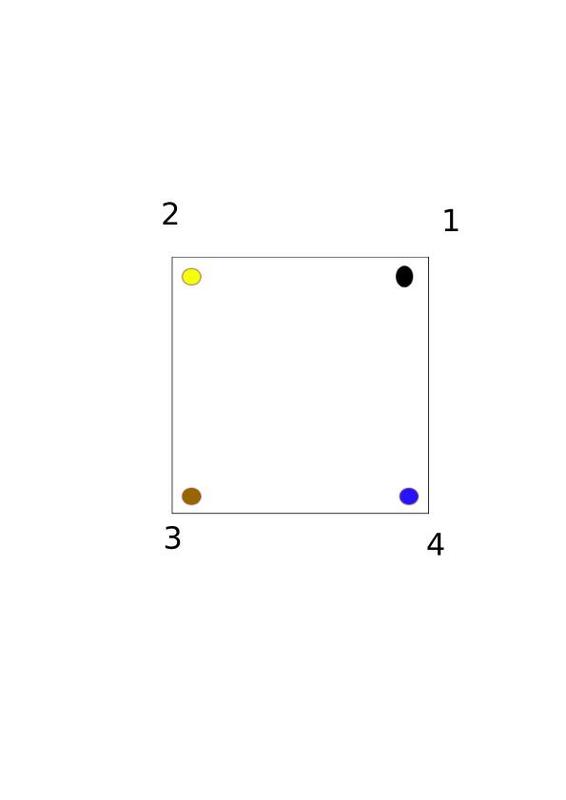 For example, takes position 6 to position 5 (to see this, just follow each color of dot around 180 degrees—remember, the dots are painted on the square, so they move with the square!). We can easily turn the above set into a group, as follows. The special function, i.e., the group multiplication is simply “composition of actions”. This means that the composition of actions and , written , just means “first do , then do ”. This is completely analogous to the case of the permutation groups, where the abstract group multiplication was “first do this permutation, then do that permutation”. The identity element is clearly , which obviously keeps every element fixed, since doing something then doing nothing is the same as just doing the something, and doing nothing then doing something is the same as just doing the something, so that for any $a$ in the above set (remember, the set above does not explicitly have an in it, but this statement just means “for any arbitrary element, arbitrarily written as , in the set”). The fact that this function is associative is obvious. In fact, the reason for this operation’s associativity is exactly the same as the reason for the associativity in the case of the permutation groups, and if this reason has slipped your memory you may want to review lesson 24. Finally, it’s easy enough to find the inverses of any of these elements. The inverse of any , i.e., any “reflection”, is simply itself. For example, (this is simply stating the fact that if you flip a napkin twice about the same axis, you’ll be back to where you started). And finally, the inverse of any of the standard rotations (i.e., by 90 degrees), is just the rotation that “rotates you through” to 360 degrees. For example, the inverse of the 180 degree rotation is just the 180 degree rotation again, and the inverse of a 90 degree rotation is the 270 degree rotation (because we don’t have a “negative 90 degree” rotation). Since we have a multiplication rule that is associative, an identity element for that rule, and inverses for every element in our set, we indeed have a group! To end this lesson, let me show you that this group is non-commutative, meaning that there are elements (where ) such that . To do this, we need to have at least one reflection, since it should be clear that the usual rotations (i.e., without flips) are all commutative, since these simply add their degree of rotation just like integers. But suppose we consider and . If we consider , which means “first do then do ”, then we first do , which is the 90 degree rotation counterclockwise, and then we do , so that the total action takes . This is because the 90 degree rotation takes corner 1 to corner 2, and the reflection doesn’t touch corner 2, and the 90 degree rotation takes corner 2 to corner 3, but then the reflection takes corner 3 to corner 1, this giving the net action “corner 2 to corner 1”. The other corners you can work out similarly. We then note that this action is precisely . We thus have . If we follow the exact same logic but do so in a different order, thus considering , we’d find that . Since , we’ve thus found that , and therefore this dihedral group is not commutative! Since this lesson is already pretty lengthy, we’ll pass on exercises for now. If you want to keep fiddling around with these groups, though, then I challenge you to express each rotation ( ) as the composition of two reflections ( ). Also, try finding some other pairs of elements that don’t commute. I should note before moving on to other topics that the construction of dihedral groups can be made for a regular polygon with an arbitrary number of sides, and not just the square. We won’t explore this in detail, but hopefully the example of the square that we’ve explored here has made it clear how we would generalize this to regular polygons with sides. The more sides we add to the polygon, the more symmetries it will have. For example, a regular octagon (a stop sign) will be symmetric under rotations by 45 degrees (as well as 90, 135, 180, etc. ), and will have 8 axes of symmetry about which we can flip. We won’t explore these yet, but I encourage the interested reader to play around with them. For now, we’ll go learn about subgroups.